You are here: Home Media News Welcoming Beatrice Abade! Beatrice Abade, a Kenyan national, joins us as a Programme Management Officer from The World Bank office in Kenya where she has been supporting the team working on Education and HIV&AIDS. Ms Abade holds a Masters in Business Administration from Moi University and Bachelor’s degree in Education and French from Kenyatta University. She has also holds a certificate in Management from Strathmore University and a higher diploma in Commercial French from Alliance Française. 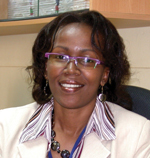 Ms Abade comes to the BecA-ILRI Research Platform with more than 10 years of past experience. She will provide support in the fields of research management, budgets and accounting, communication and office management to the BecA-ILRI Research Platform.